In the fallout from the 2016 election, there has been a diverse set of reactions. Some protest, some celebrate, and it seems that some (despite their candidate winning) continue to repeat talking points that have no basis in truth whatsoever just to stoke their anger about the establishment. As demonstrated by the circulating of "fake news" throughout the campaigns, some people take whatever floats through their news feed on Facebook as fact. This was shown very clearly on Wednesday, when a group of Donald Trump supporters claimed rampant voter fraud had occurred. And the CNN anchor's reaction was all of us who are fed up with these inaccurate claims. 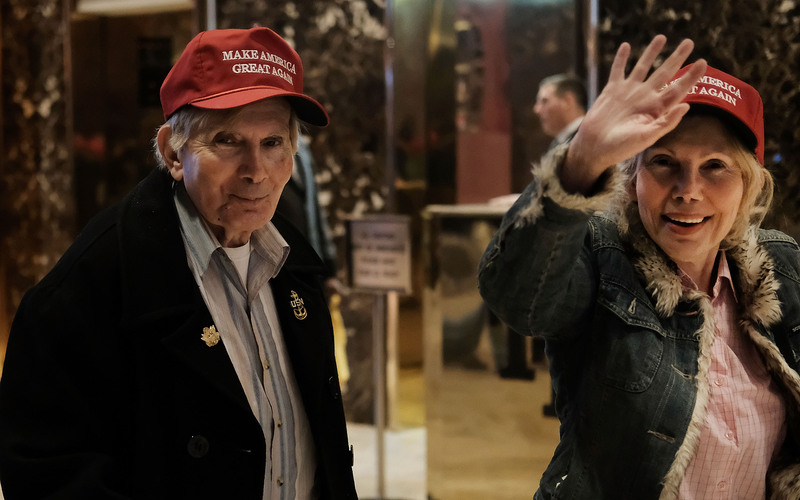 Over the course of the election, CNN's Alisyn Camerota has interviewed a group of Trump supporters to get their opinions on events as they transpired. This week, she did a post-election discussion to catch up with them since Trump's win. They talk about the president-elect and his appointments and decisions thus far. The entire interview is pretty fascinating, in that it seems like the supporters have pivoted their personal opinions and make excuses for Trump whenever Camerota points out the conflicts between what they told her in previous sit-downs and the current one. The most illuminating point, however, came a few minutes into the interview. Camerota asked about the white nationalist movement and the "alt-right," and referred to reported instances of groups which have invoked Nazi-era signs and chants, and how that relates to Trump's appointment of Brietbart's Steve Bannon as chief strategist. Paula Johnson, a panel member with quite a few things to say, told her that those things have "been around forever," and that if the media keeps covering these events, then people will keep talking about them. Apparently, if they would just let it go, they would disappear. If that's not incredible enough, Johnson then went on to talk about voter fraud, saying, "Voting is a privilege in this country, and you need to be legal, not like California where three million illegals voted." Camerota asked her where she got that information, and Johnson vaguely cited "the media," and also said it could have been CNN. Then she backtracked and said that if CNN didn't do a story on it, they were being smart. Camerota asked how many undocumented people voted, and she responded, "I think that there was a good amount, because the president told people that they could vote, and it happened in Nashua [NH], we caught some people, and they went into Nashua [NH] and they said, 'The president said I could vote, I'm here illegally.'" Camerota asked if she heard Obama say that undocumented people can vote, and another panelist, Susan DeLemus, chimed in that they did. And where did DeLemus say Camerota could find this information? "Google it. You can find it on Facebook." So Camerota did Google it, and found an article explaining that a video of President Obama had been edited to make it seem like he was encouraging undocumented immigrants to vote, when a transcript revealed he did not. Once again, Camerota tried to make sense of the statement, asking the women if they believe that millions of undocumented people voted. And it was Johnson who came in with the most absurd response possible: "California allows it." Camerota, clearly in disbelief that someone could accept this as fact, stumbled to say, "They do not allow illegal... you mean illegal... you mean voter fraud, California allows?" This is where she finally put her hand to her head. And Johnson didn't exactly confirm that she believes this, but she did say that she believes voter fraud occurred. While it comes off as a crazy, misinformed statement of belief to most people who actually pay attention to reporting, it probably doesn't help that Trump himself has voiced his own opinion about voter fraud taking place during the election, despite his Electoral College win. The truth is that there is no proof that rampant voter fraud occurred. In fact, there have been extremely few actual cases of voter fraud confirmed. The idea that some of Trump's supporters tend to believe what they hear without any question is still a very scary reality, but one that we need to continue fighting for the sake of truth.